Fastrax are a UK gravity conveyor manufacturer, From Gravity Roller Conveyors, standard belt conveyors and more specialised heavier duty Belt conveyor from mild steel, Extruded Aluminium and stainless steel gravity roller track. Delivered on quick deliveries throughout the UK and Europe. 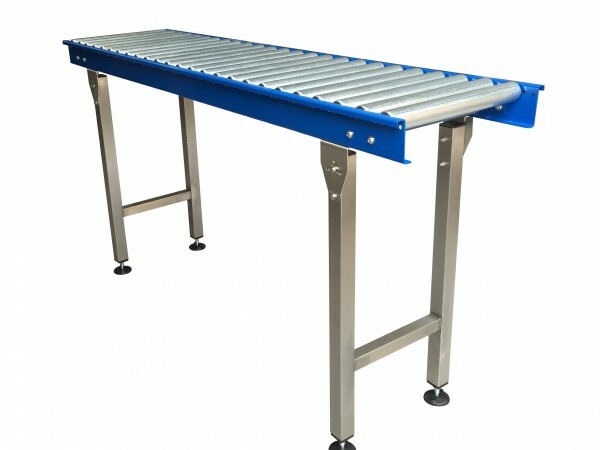 Fastrax medium duty gravity conveyor are available in painted mild steel, stainless steel and with further options for PVC rollers, manufactured to your specifications we are able to make conveyors with lengths and widths to suit to your needs. Below are our standard range of rollers. Standard 50mm roller in PVC, Stainless Steel or Zinc plated. High Duty 50mm roller in PVC, Stainless Steel or Zinc plated. Heavy Duty 63mm roller, mild steel zinc plated. Ball Tables with mild steel zinc plated rollers. Our Roller tracks provide an ideal solution for pallet handling. We manufacture a wide range of reliable, cost effective modules and components. From a one off replacement roller to a multiple roller conveyor system, we are able to offer proven conveyor products at a realistic price. We are aware of the changing needs of your business, which is why our flexible manufacturing allows quick deliveries throughout Europe on standard gravity roller and belt conveyors and conveyor components. As a conveyor and component manufacturer we manufacture a wide range of conveyors and industrial roller track, (Including PVC / PU Belt conveyor , gravity roller conveyor and lineshaft driven roller within our conveyor range.